In addition, special exhibits focus with more detail on specific historical events or topics: Turns of the Centuries, Raid on Deerfield: The Many Stories of 1704, Shays’ Rebellion and the Making of a Nation, African Americans in Early Rural New England, and Map to African American Historic Sites. 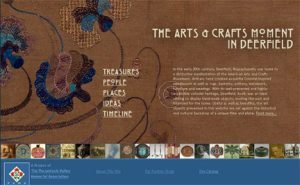 The Arts & Crafts Moment in Deerfield parallels the publication of Poetry to the Earth: The Arts & Crafts Movement in Deerfield, by Suzanne L. Flynt, available here. 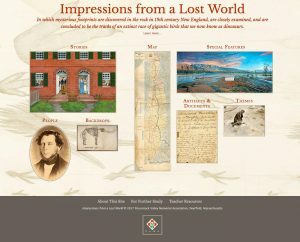 The most recent of our educational websites, “Impressions from a Lost World,” focuses on the history of the 19th-century discovery of dinosaur tracks in the Connecticut River Valley (before the word “dinosaur” was even used). Visit dinotracksdiscovery.org here!